Traveling gives you a great opportunity to try local flavors and cuisines, street vendor delicacies and cheap snacks. Unfortunately, in Australia, most of those things are American. If you need a quick bite, you can go to 7-11, stop by a Baskin Robbins, or get a bag of Doritos at the grocery store. If there is a typical Australian snack food, it might be the meat pie. It’s cheap and portable, and as easy to find here as crepes are in Paris; just head to the nearest pub or bakery. There are several variations (beef, kangaroo, tandoori, Thai, etc.) so you can experiment with flavors. Some places will offer it with mash and peas on top, or as a floater, which includes gravy. If they ask if you want “sauce”, they likely mean bbq or ketchup. When you’re tired of meat pies, or when you have to eat in less than 15 minutes for less than $5, you may have to resort to fast food. No worries. Even within the American grease establishments, there are some less-than-American options. Oporto is a slight step above fast food, offering fresh roasted chicken, either whole, in a burger, as nuggets or in a wrap. You may want to leave their special chili sauce off, as it’s an acquired taste. The french fries here are incredible, flavored with a spicier seasoning than the regular salt you get at most places. When I had no other options but fast food, Oporto was always my first choice. Before you turn your nose up at this suggestion, read my earlier entry on why I think you should always try to eat at a McDonald’s when you’re in a foreign country. At home you might call it Micky D’s, but here it’s “Maccas.” You can still get your Big Mac, supersized fries and an apple pie for dessert, but why would you? Why not try the Seared Sweet Chilli Wrap or the McFlurry made with Flake bars or Milo (an Ovaltine type powder)? McCafe was an option in Australia long before they started to appear in North American, and you’ll find roughly the same selection in both places: a nice selection of muffins and cakes and pastries. Try the mango cheesecake or passionfruit kiss biscuits for a little zing in your mouth. Yes, they are exactly the same. The only difference is the name. Hungry Jack came first, and some were renamed Burger King, but the Aussies didn’t like the Americanization of the restaurant they grew up with, so now you see both, sometimes within a block of one another. The Whoppers and onion rings are just like you remembered them, but get an Aussie Burger for that fresh taste of egg and beet root. Mmm, mmm, beet root. They even have the Subway diet here. Can you believe it? There’s not much difference in the local menu, but there are some special Aussie toppings, like beet root. They really like that beet root. The Colonial is a popular guy down under. The chicken substance is identical, but if you want a dipping sauce you can choose from the usual bbq amd sweet and sour, as well as chili or satay. Forget about getting some good ol’ southern biscuits though, they’ve never heard of them. The commercials are completely offensive, and would never be run in a country that had any kind of Latin community, but the food is just like back home. Whether or not that’s a good thing is up to you. Compared to most Australian “Mexican” restaurants, it’s a welcome taste of authenticity, which is saying something. Pizza is pizza. Both are decent. For something different you can get the Aussie pizza at Dominos which includes bacon, egg, onion, tomato and cracked pepper on bbq sauce. The Chilli Prawn pizza, which includes baby spinach, onion, chilli flakes and chilli sauce also sounds like an adventure. No big chains for kebabs, but small take away places are abundant, although slightly pricier than typical fast food. A beef (a.k.a. doner) kebab or falafel roll will run between $5-8, and some places offer good kebab/fries/drink combinations for under $10. The eats here run about $10 a person, but if you’re craving a big, warm, hearty meal, you won’t be at all disappointed. You get a hunk of delicious, freshly baked bread just for sitting down, the portions are large, and the service is faster than most fast food places. Betty’s is located in the heart of Oxford Street, so it’s the perfect place to grab a bite before hitting the surrounding bars and clubs. I got to live in this happy yellow house in Newtown during my time in Sydney. Finding a good flat in Australia is a lot like apartment hunting back home. The difference is that if you’re on a working holiday or studying abroad, you probably won’t want to sign a long-term lease, which means you’ll either be subletting or looking for flatmates who only need a roommate for a short time. 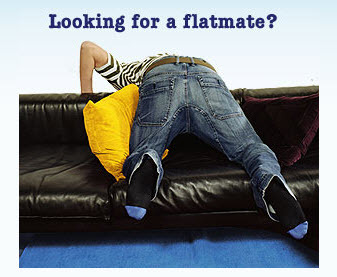 There are plenty of ads in the newspaper and online for flatmates wanted (flatmates.com.au is a good site to start with), but your best bet might be looking on the street. Get an idea of what part of town you want to call home, and look for fliers. There are always ads up around hostels and university campuses. These areas have a large turnover of students and travelers, so finding a room for a few weeks or months shouldn’t be difficult. Expect to pay anywhere from AUS$90 to $140 per week, depending on how many people you share with and location. Even though you may feel pressure to find a flat quickly when you arrive, don’t jump into a situation until you’ve seen at least three or four different places and have asked all of the right questions. What questions are those you wonder? Why, they’re written right here. Don’t be offended if some of them seem obvious. Sometimes it’s the most obvious questions that are the easiest to forget. Sites like flatmates.com.au are great for finding "flatmate wanted" ads, but fliers in hostels and cafes are another great resource. 5. Is there Internet access, and do I need to chip in for it? 7. Does anyone here smoke? In the house? 8. Is it alright if I use your kitchen appliances and cookware? 9. Do you share food? Do you split the cost for items like toilet paper, dish soap, cleaning items? You may also want to ask about proximity to public transportation, noise, where the nearest grocery shopping is, safety issues in the neighborhood, and anything else that’s important to you feeling comfortable. Most of all, consider whether or not you can see yourself enjoying getting to know these people. The main advantage to getting a room in a flat, instead of a hostel or travelers house, is that you can live with some friendly locals, so make sure you pick locals who you can imagine turning into friends. This is one that I’ve actually done already, so I’m confident in saying that it’s an experience you’ll love. There’s really no bad part of Australia to see, just parts that are more difficult to get to. When I was in Sydney, almost all of the Aussies I met insisted that I couldn’t go home until I’d seen the red dirt. “It’s the real Australia,” they told me. “It’s like another planet,” other travellers said. I joined a tour group and travelled from Adelaide to Alice Springs over a few days and found that they were both right. The landscape is beyond foreign, and the wildlife you encounter, often dead on the side of the road, is like nothing you’ll see in a zoo. Because the middle of the country is so far, and so dry, the small towns that exist there are made up of the most rugged and hearty individuals. Our group spent one night in Parachilna, population: 8. There’s a hotel/pub and a hostel there for people passing through, but nothing else. It might sound dull, but you get enough backpackers in the middle of nowhere – with no neighbors to bother, no lights to spoil your view of the stars and nowhere else to go – and you’ll be amazed at what a good time you can have. The Red Center is also where you can find some of the most authentic Aboriginal cultural experiences and really get a feeling for what life was like before Western culture moved in. Travel CUTS can hook you up with an Outback tour and help you figure out how to build it in to the rest of your trip. From Alice Springs you could go up to Darwin to check out the massive termite hills (they’re freaky big), or swing up to Cairns and do a little sailing. All of Australia is open to you, so dive on in! Travelling on a budget means that sometimes you might have to pass up something you want to do because of the obscene price tag. In New Zealand I would have loved to go for a ride in a stunt plane, but at $350 for 20 minutes, I had to pass. To compensate, check out some of the fun and unusual events that take place around the world. Some festivals are free while others charge a small entrance fee. For example, while doing some Googling about travelling Scotland, I came across a link for the World Porridge Making Championship in Carrbridge. Really. It’s the championship for porridge makers around the world. I was directed to goldenspurtle.com, where I learned that along with the porridge contest, there is also a chainsaw carving competition in Carrbridge every year. Your friends would be in awe. Find more unusual festivals you can include in your travel plans, and send me some photos of the weirdest ones. The film “Amélie” made it popular, but the French certainly weren’t the first to take an inanimate object and make it the star of travel photos. I’ve seen it done with other gnomes (Travelocity is a fan of them), plastic lizards, stuffed bears and Barbies. None of them are cuter than my travel buddy though: Spike the Rhino. The Wairaki Terraces, New Zealand, sans rhino. Spike takes a steam bath. A little travel friend is also a great conversation starter. People always want to jump in a photo with Spike, ask me where he’s been and tell me about their own photo habits. Some want pictures of outhouses around the world, others collect photos of flowers or food. Even if you don’t speak the same language, a funny photo is something you can share a smile over. Who are your travel friends? You are currently browsing the Student Travel: Cheap Thrills from Around the World blog archives for March, 2010.